In this article we will see how to show the date selected in the datepicker textbox in some other container. Often we have requirement where we want to show same date in different formats. We cannot show same date in different formats in same container (like textbox). In order to achieve this we can create another textbox and can show same date selected in other format. We will see this feature integrated with MVC3 Razor application. We have created a ViewModel. We will bind this ViewModel to our view. The poperty defined in the ViewModel will be rendered as control. We will use this property to use DatePicker. altFormat: "DD, d MM, yy"
In the View, we have binded the ViewModel. We are using EditorFor to render control for our DOB property. We have also created one textbox. On selecting the date from datepicker, the alternate textbox will show the date in different format. Click inside first textbox to open datepicker. 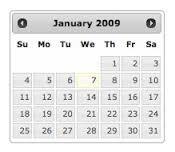 When you select date after opening the datepicker. The date gets displayed in the textbox also date gets displayed in alternate textbox with spcified format. By this way we can display the selected field in alternate control with another format for user convinience.